"Stay All Around Nature in a Palatial Lifestyle"
Landmark 'Green County' is New Civilization that sets apart the living from others at Bolar in an area of 1.32 acres of land with 80% open space having a exotic river and sea view. It consists of two towers having 14 floors each with 121 apartments, along with modern amenities like Roof Top Swimming Pool, Jogging track, Indoor games, Children's play area, Garbage Chute, A/C Health club, Table Tennis, Snooker, Meditation Room (yoga), Solar Water Heater, Reticulated Gas, Recreation Hall, Two level car parking, 24 hour power and water back up. 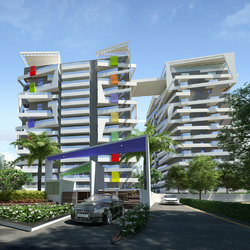 At an affordable price of Rs 3800/sq ft.